We believe that everyone should be able to enjoy mindful, healthy and tasty meals. That’s why we’ve come up with five simple steps to help you become a more mindful eater and rediscover the joy of mealtimes. Below is a mindful eating exercise you might like to try. If you can’t do this safely, don’t worry, you can still learn how to eat mindfully by consistently following the steps above to the best of your ability. Take the a grape or another bite sized piece of fruit and become aware of as many details as you can. Notice its texture, smell, colour, size, shape and the sensation of it resting on your palm. Appreciate the grape by giving some thought to how it arrived in your hand, how it was grown, harvested, and distributed. Now put the grape into your mouth without chewing or swallowing it just yet. Notice how it feels, where the tongue is and the possible urge to chew. Then bite the grape and notice the sensation of it between your teeth and on your tongue, the clenching of your jaw while chewing slowly and the juiciness as it is swallowed. It may help you focus better if you close your eyes and take in all the sensations happening in your mouth and throat. How did you find this experience? A grape has probably never tasted so good! The example of mindful eating used above involves a grape, although you can try this with any food you choose. It's not the meal that we eat but our attitude and relationship to the food that's important. Research has found that eating slowly gives your body more time to signal to the brain that it’s full and as a result, it can help you feel more satisfied and better manage your weight (1). 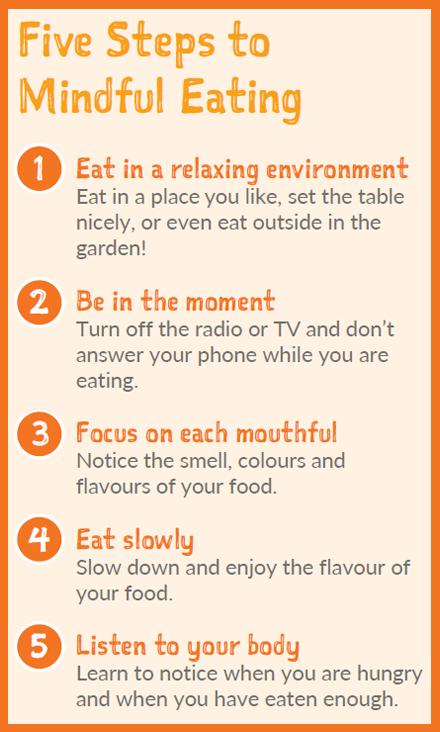 Next time you go to enjoy a meal or a snack, take your time by following these 5 steps to mindful eating, and it may just be the best meal you’ll ever have! Pintado-Cucarella S, Rodríguez-Salgado P. Mindful eating and its relationship with body mass index, binge eating, anxiety and negative affect. Journal of Behavior, Health & Social Issues. 2016;8(2):19-24. Newer PostShould you take vitamins?